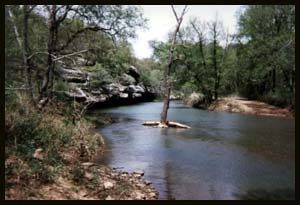 Cedar Bluff on Greenleaf creek. I think it is so pretty here. The water is so clear and there are a lot of fish here too. 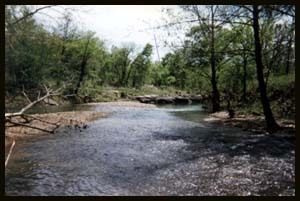 Looking North up the creek. Cedar Bluff road crosses the creek here. If you keep driving East you will get to the Slab bridge over Greenleaf creek at Burnt Cabin road. Go West from here and you get to the old Greenleaf school site at the corner of where Cedar Bluff road, Greenleaf road and Pumpkin Center road meet, just North of the Greenleaf bridge. This is looking South down Greenleaf creek at Cedar Bluff. There are some flat rocks that you can see in the distance. It is a good place to fish or just to hang out. I have had picnic's in this area a few times. It is also a good place to play in the water. I have fun wading in this creek. 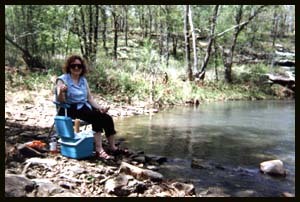 Me on a picnic at Cedar Bluff on Greenleaf creek 4-27-1996. This is just a few feet South from the Bluff (picture) above.